The story of the musically talented Boulanger sisters, the one (Lili) dying young in 1918, the other (Nadia) giving up composing and becoming a worl famous pedagogue and conductor, is almost a plot for a film. But the two left behind a significant body off music. 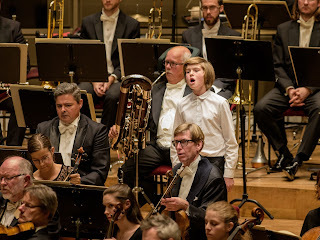 For their 2015 Composers Festival (Tonsättarfestival) the Royal Stockholm Philharmonic Orchestra (Kungliga Filharmonikerna) devoted the 2015 festival not to a living composer but to the Boulanger sisters (Systrarna Boulanger), a testament to the great significance the two had in 20th century musical life. There was a week of events in Stockholms Konserthus, the orchestra's home, and I went along to the concert on 15 October 2015 to catch a group of works by the Boulanger sisters conducted by Marc Soustrot. The programme included D'un matin de Printemps, D'un soir triste, Psaume CXXX "Au fond de l'abime", Pie Jesu by Lili Boulanger (1893-1918) and Fantaisie varie for piano and orchestra by Nadia Boulanger (1887-1979), plus Nuages and Fetes from Debussy's Images and Sicilienne from Faure's Pelleas et Melisande, with Stefan Lindgren (piano), David Weissglas (treble), Katija Dragojevic (mezzo-soprano) and Göran Elisson (tenor), with Capella Catharina, Katarina Kammerkor, Katarina Flickkor, Katarina Manskor. 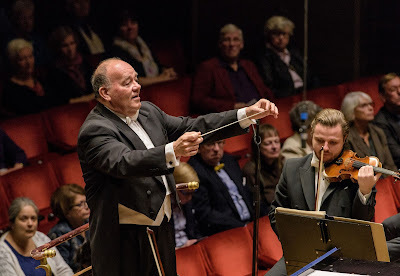 Amazingly, many of the performances were Swedish premieres and it was the first time that conductor Marc Soustrot (himself French) had conducted any of the music by the Boulanger sisters. All of Lili Boulanger's works in the concert dated from 1917/1918, the years before her untimely death. D'un matin de printemps is a short, atmospheric tone poem written for large orchestra. There was a lovely pointillist character to the piece with a clear sense of being post-Debussy. Lili Boulanger's writing for the orchestra created a web of delicate sounds, this was rarely a loud work despite the size of the ensemble. And I could hear hints of Dukas and possibly Koechlin in the music. The orchestra followed this with two movements from Debussy's Images, written in 1899. There was a lovely shimmer to the sound in Nuages with a nice flexibility and fluidity with a tempo full of forward movement. There was a lovely nutty cor anglais solo, but also a hint of danger beneath the clouds. Fetes started out rightly infectious with a shapely feel to the swift phrasing and enormous detail coming over in the orchestration. There was a very particular quality to the orchestral sound in the loud climaxes where the combination of orchestra, acoustic and conductor gave a real clarity and precision to the sound. Nadia Boulanger's Fantasie variee for piano and orchestra was written for Raoul Pugno in 1912. If Lili Boulanger's music reflected more or less contemporary French music, Nadia Boulanger's seemed strikingly different. Dark and powerful, the Fantasie variee seemed to represent the illicit love-child of Rachmaninov and Cesar Franck, with echoes of Liszt. Based around a strong motto theme, which was subject to a series of variations creating a striking multi-sectional work, the biggest drawback seemed to be the largely unrewarding piano part. 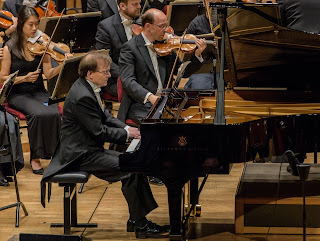 Based around florid, heavy, passage-work, the incessant nature of the piano writing meant that Stefan Lindgren's role in learning and performing the part was simply heroic. But despite a sterling performance, he was ultimately unsuccessful as he simply lacked the ridiculously herculean power that would be needed for a pianist to impose themselves on the work. As it was, too often the piano seemed clumsy decoration on the orchestra, and at times balance entirely favoured the orchestra, it was only in the passages where the two were in dialogue that Stefan Lindgren's fine performance could be appreciated. You feel that the work is one Nadia Boulanger would surely have revised, had she not stopped composing. It is however a remarkable work, strong and full or drama, a reflection perhaps of the interior life of this fascinating woman. After the interval Lili Boulanger's D'un suir triste made you wonder to what the title referred. Written in 1918 (the year of her death) it was a dark, edgy piece with rather occluded harmony and some chunky textures. At one moment there was an almost Ivesian combination of parallel harmonies. A work of drama but one with a constant sense of movement, the question was where? By contrast, the Sicilienne from Faure's Pelleas et Melisande suite was pellucid and seemingly effortless with its flute solo. Lili Boulanger's setting of Psalm 130 ('Out of the Depths') is a big work, Written for chorus, organ, orchestra, mezzo-soprano and tenor solos, it formed a large continuous sequence each moment responding to the words. Starting from a long, dark orchestral introduction much of the choral writing was simple seeming yet expressive. For all her huge forces, Lili Boulanger was not frightened of reducing things down when the text called for it and there were some lovely transparent moments. In its large scale complexity the work rather reminded me of Florent Schmitt's Psalm 47 (written in 1906). Lili Boulanger kept the soloists till the end. 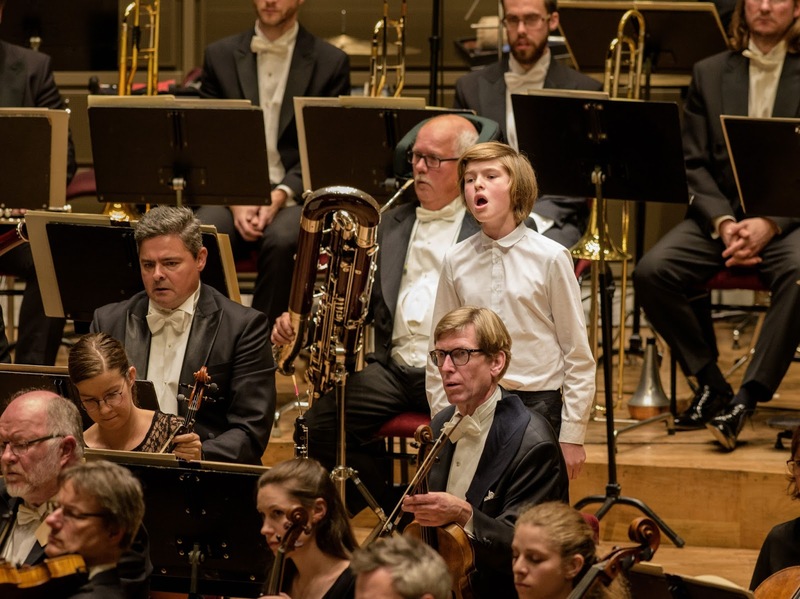 There was a long, beautifully expressive solo from mezzo-soprano Katija Dragojevic, though tenor Goran Eliasson seemed to be under used, but there was a moment when the two soloists intertwined beautifully. The final climax, when it came, was highly violent with a strong role for the chorus. These acquitted themselves well, though certainly taxed by some of the more complex writing. Ultimately the work seemed to sprawl a bit, but this was an impressive piece too and one had to remember it was young person's music and Lili Boulanger has the constant sense of 'what if' hanging over her. This was not the end, and without a break for applause, we were led into Lili Boulanger's setting of the Pie Jesu sung by treble David Weissglas. This was a questioning, complex work and you got the impression that Lili Boulanger did not quite believe that the Lord would give rest. But Weissglas gave a confident account of a taxing solo, accompanied just be organ and solo string quartet. Everyone concerned gave superb performances throughout, faced with a long programme of unfamiliar music, in a style which is not easy to assmilate. I only hope the festival generates further interest and performance in the music.